There, spread out all over the floor, were the mechanical pieces of a robot. Something had torn it apart, and the debris spanned a radius of a few meters. There was no sign of what might have caused this tragedy. What monster, what disaster, could cause this much damage to a mechanical creature? What was the robot trying to tell us with his last words? Here are the functions for the output (in Java). 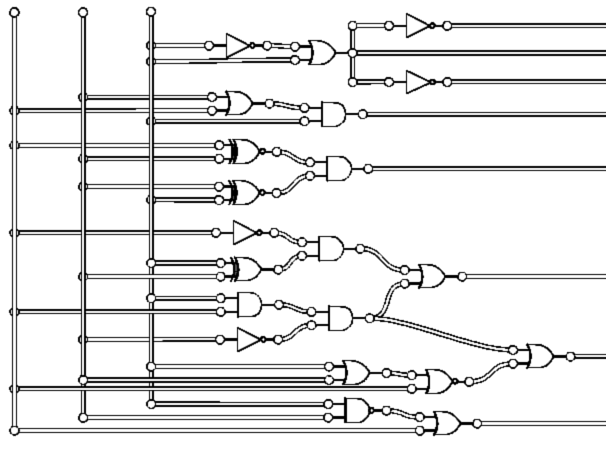 you can create a Truth table: |A|B|C|1|2|3|4|5|6|7|8|Hex|Char| -------------------------------- |0|0|0|0|1|0|0|1|0|1|1|4b |K | |0|0|1|0|1|0|0|0|1|0|1|45 |E | |0|1|0|0|1|0|0|0|1|0|1|45 |E | |0|1|1|0|1|0|1|0|0|0|0|50 |P | |1|0|0|0|1|0|0|0|0|0|1|41 |A | |1|0|1|0|1|0|1|0|1|1|1|57 |W | |1|1|0|0|1|0|0|0|0|0|1|41 |A | |1|1|1|0|1|0|1|1|0|0|1|59 |Y | From this truth table it is obvious what the message is. Not the answer you're looking for? Browse other questions tagged logical-deduction computer-puzzle circuitry or ask your own question.